Be a part of the Council! If you are not already a member, become one!! Help the Trail be the best urban trail experience in America! The Trail Council is a dynamic organization, supported by Parks & People Foundation with the cooperation of Baltimore City Department of Recreation and Parks, to promote the Trail, to facilitate and support its maintenance, and collaborate with diverse partners to create a natural, safe, inviting, green space for everyone to enjoy. The Trail Council implements its strategies and activities through its members and their organizations. Anyone can become a Trail member and all Trail members are invited and encouraged to share their valuable skills and insights with the Council. If you are already a member, please renew your membership - your support is greatly appreciated! Please invite your friends, family, and neighbors to become members as well. 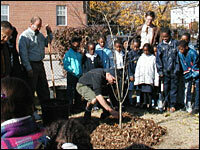 Let them share your sense of commitment to one of Baltimore's most unique natural resources. There are many exciting volunteer opportunities along the Gwynns Falls Trail. From helping to beautify the Trail by pulling weeds and planting trees, to gardening, to leading tours, and assisting at events. We need your help!